In terms of shameless personal corruption on a broad party political level, I doubt that anything can match the extraordinary efforts by MKs from the majority of political parties, who are promoting legislation calculated to damage or destroy the nation’s most popular and widely circulated daily newspaper. The campaign against Israel Hayom is beneath contempt. It emanates from Noni Mozes, the publisher of Yediot Achronot which, prior to the advent of Israel Hayom, totally dominated the mass media. 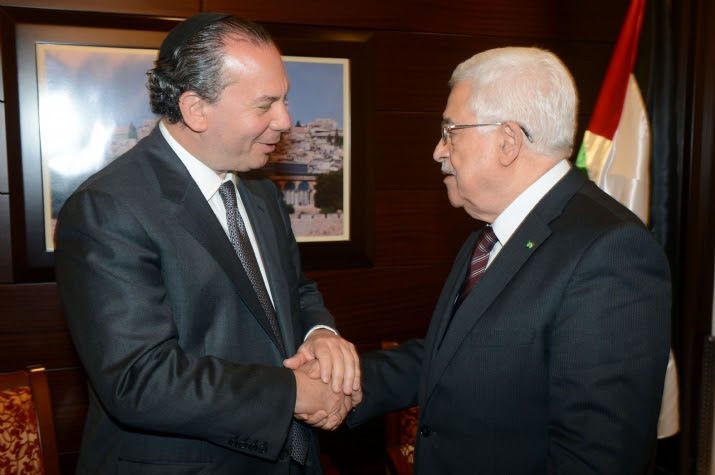 Israel Hayom was established by billionaire philanthropist Sheldon Adelson, a friend of Prime Minister Netanyahu who is also probably today the greatest philanthropist to Jewish and Israeli causes. The paper is politically center-right and its editorial policies basically support the Netanyahu government. Yet it prides itself on opening up its pages to opposing viewpoints – ironically including op-eds from some of the MKs now seeking its closure. In contrast, Yediot was notorious for excluding any dissenting opinion whilst frenziedly promoting supporters, such as former discredited Prime Minister Ehud Olmert. 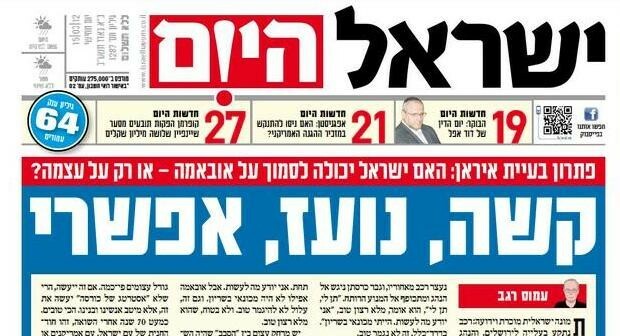 With a team of outstanding journalists, Israel Hayom shattered the left wing monopoly of Yediot and Ha’aretz and is now the most popular tabloid in the country. It has succeeded in expanding newspaper readership in Israel at a time when it was shrinking throughout the rest of the world. It also, in a very short time, obtained the support of major advertisers demonstrating that, as in other countries, free newspapers in Israel can also become successful commercial enterprises. The bizarre argument employed by those promoting the legislation is that in order to ensure freedom of expression and maintain competition, a newspaper must not be permitted to be circulated on a free basis. This premise is so primitive that it does not warrant a serious response. The suggestion that legislation denying free circulation of a newspaper would strengthen freedom of expression is a concept that George Orwell would have relished to describe as a classical example of “doubletalk”. It is also ironic that Labor MK Eitan Cabel, himself a former minister overviewing the Israel Broadcasting Authority, was at the forefront of demands that taxpayers’ money be invested in order to retain the bankrupt Channel 10 TV. Yet he has no shame in now spearheading efforts to close down Israel’s popular independent newspaper. The proponents of this legislation are motivated by two factors. They are frustrated with the presence of a powerful newspaper which refuses to join the traditional media bashing and personal vilification of Prime Minister Netanyahu. Secondly, many of the MKs who are engaging in this operation are enjoying the rewards of being gleefully promoted by Yediot Achronot – the sole beneficiaries of the demise of Israel Hayom. Those promoting the legislation are predominantly from the Labor Party and Bait Yehudi. For Labor, a party which purports to be at the forefront of promoting civil liberties, to be engaged in supporting a Bolshevik style infringement of freedom of expression, is utterly hypocritical. But Naftali Bennett of Bayit Yehudi is even more loathsome. How a purported nationalist religious leader can have the chutzpa to actively support legislation that would close down the sole newspaper promoting the national camp is simply despicable. It is difficult to comprehend why other members of his party enable him to pursue his vendetta against the Prime Minister which, if successful would have an immensely negative impact on their cause. Bennett disgraces the national religious cause when he unashamedly allows his personal prejudices to betray his ideology and adopts an approach which would harm the national camp. If he proceeds along this path, religious Zionists should make it clear that they would not support the party so long as he remains leader. The fact that 80% of Israelis polled indicated their opposition and indignation to this proposal paints a clear picture. Even though the legislation will not pass, it remains a blot on the Israeli political system that these hypocritical politicians felt sufficiently secure that they could behave so arrogantly without a massive electoral backlash. Unless they withdraw their wretched legislation we would be doing ourselves and the nation a great service if we communicated our intentions of punishing them at the next election.